Do awesome dance moves count? SNAP--a girl sexts racy pics of herself. She thought the fun shots would stay between her and her boyfriend. SNAP--an anonymous hacker hijacks her photos. If she doesn't obey, she'll be exposed. 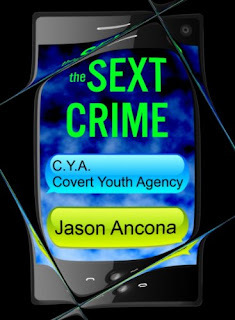 SNAP--the Covert Youth Agency takes the girl's case. The agents jump headfirst into Operation: Sext Crime. Their new client has less than a week to surrender to the hacker's ultimatum. Or else the naughty photos go "wide." SEND--a squad of goons are closing in on C.Y.A. members. Agent identities may be unmasked. WARNING--this book contains NO explicit sexual content. Material suitable for ages 12 and above. May contain some humor. Pi, Lightman and Tollhouse are back for another installment of Jason Ancona's hilarious and brilliant series! If you haven't yet put these books on your TBR list, I intend to change your mind before the end of this review. Trust me, they are too good to pass up. Do you love hilarity? Are you amused by witty sarcastic banter? Does the idea of adorably awkward teenage interactions make you smile? This is a series for you. The Sext Crime brings back all the fantastic characters. There's Pi (Peter) the math whiz and adorable nerd. He's smitten with Vera, who he's too afraid to talk to. Then there's Lightman. Or Delilah, but don't call her that or she'll probably hit you. Hard. She's a bit of a tomboy, and computer hacker extraordinaire. Rounding it out is Tollhouse, the sweetest and probably silliest guy you'll ever meet. He's witty, loves a good conversation, and fights with Lightman on an almost constant basis. Point being, this motley crew of kids fits together perfectly, and they will pull you in to the C.Y.A. I guarantee it. This second book had me enamored with each page that went by. I liked the first C.Y.A. book, The Case of Tangled Love, but I think that it is here that the characters really come into their own. I could see the real bond between the three of them. More than friendship even, since they are connected to something so secretive. However what was added to this story that I loved, was an extra element of depth. See, in this story each of the characters goes their own way and is learning who they really are. Sure there's still that bond of friendship, but it's nice to see that they each have their own personalities that can stand apart too. I'm going to change my like to a LOVE for this one. Wondering what I mean? Too bad, you'll have to read. I shan't spoil it for you. What I can say is that the plot in The Sext Crime is fantastically written! If you are a fan of mysteries, this will be on that draws you in. The use of technology in this book creates really familiar territory for teens, and I know even I was nodding along with agreement, even when I couldn't figure out the mystery. Along the way you'll also be treated to witty banter between the characters, hilarious situations, and a few laugh out loud moments. I'm probably rambling, but that just goes to show you how much I love these characters. They make me laugh, and isn't that what we all need sometimes? I'll wrap it up here, since you're probably reeling from me trying to explain so much in so little space. Suffice it to say that Jason Ancona remains one of my favorite hidden gem writers! His writing is always a little different, but I'm not afraid to say it just keeps getting better and better. I know I'm a rambler, but I can guarantee you that if you give The Sext Crime a shot, you'll find something to love. I'm a C.Y.A. fan and I'm proud of it. Click the banner for more stops along this tour!